In a new court filing unsealed on Saturday, prosecutors cited sentencing guidelines that could result in a prison term of up to 22 years for Paul Manafort, President Trump’s former campaign chairman, for conspiracy charges to which he pleaded guilty last fall. 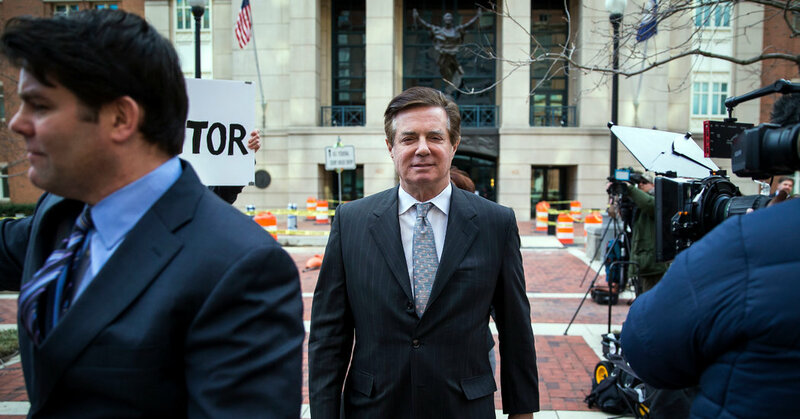 Mr. Manafort is scheduled to be sentenced next month for the conspiracy charges, as well as for eight other felonies stemming from a financial fraud prosecution in Northern Virginia. Mr. Manafort, 69, admitted in September that he had conspired to obstruct justice by trying to persuade witnesses to lie to cover up the fact that he had failed to register as a foreign lobbyist in the United States. Registering as a lobbyist with the Justice Department would have required him to disclose millions of dollars in hidden payments he was receiving from Russia-friendly political parties in Ukraine over a decade. In the sentencing memo to a federal judge in Washington, prosecutors working for the special counsel, Robert S. Mueller III, said that “for over a decade, Manafort repeatedly and brazenly violated the law” — continuing to commit crimes even after he was indicted. Over all, they said, they saw no reason to depart from advisory sentencing guidelines recommending a term of 17 to 22 years for the conspiracy charges. They made no recommendation on whether Mr. Manafort’s sentence in the District of Columbia case should run concurrently with his sentence in the Virginia case. After a lengthy trial in Alexandria, Va., in August, a jury convicted Mr. Manafort of tax fraud, bank fraud and other financial crimes. The order of his sentencing dates may work against Mr. Manafort. He is scheduled to be sentenced first for the financial crimes by Judge T. S. Ellis III of the United States District Court for the Eastern District of Virginia in Alexandria, and then by Judge Amy Berman Jackson of the United States District Court for the District of Columbia. Some allies of Mr. Manafort had hoped that Judge Ellis would have the last word because he seemed more sympathetic to the defense than Judge Jackson, and he might order the sentences to run concurrently. October 16, 2018 Comments Off on Could chip fat help dirty shipping clean up its act?